They Say It’s Your Birthday…..
As the More is More Mom®, I’m all about…….more birthday celebrations! While this year I may be celebrating the 15th anniversary of my 29th birthday, Tuesday, my Nick turned 19! It’s so weird. It really seems like it’s been about 5 minutes since we brought him home from the hospital, and now, all the sudden he’s fairly well grown up and celebrating his first birthday away at college; without us. When I was little, my mom always made a big fat deal out of our birthdays; so naturally, I am of the belief that birthdays should be celebrated like it’s Mardi Gras. Over the years, we’ve had some pretty rockin’ parties for Nick. All sports all the time has, of course, been a recurring theme. Amongst my favorites, however, was Nick’s 5th grade party. It’s not easy to come up with an idea that isn’t so “been there done that”. I stumbled across the Chicago Bulls/White Sox Training Academy (which is pretty stinking painful for those of us diehard Cub’s fans). Their deal at the time was you rented the Chicago Bulls replica basketball court, equipped with a working scoreboard, buzzer and referee, at $150 for an hour. The number of invitees was unlimited, so, since more of everything is always better, we included a total of 20 kids to help us celebrate. Rather than waste our precious hour picking teams, we sent out two invitations; one requesting the recipients wear a white t-shirt, and the other requesting the recipients wear a blue t-shirt. When the boys arrived, all they had to do sit on the bench, shouting, “Put me in coach; I’m ready to play!” After the game, we went out for pizza, and as a party favor, gave each of the boys a mini basketball. It was awesome! Over the years, we’ve celebrated with several golf outings, but last years was my favorite. We surprised Nick with a huge breakfast in our home (yummy scrambled eggs, bacon and chocolate chip pancakes) with a dozen of his closest friends; pals he’s collected from Pre-school to high school. After breakfast, the boys headed over to one of Nick’s favorite courses to play 18 on his 18th. He had the very best day! This year was certainly an adjustment. I wanted Nick to feel that even though he’s away, his birthday is still a day of celebration, but how could I make a small, but thoughtful gesture? Of course there were presents, but I also packed a few packages of Hershey’s Drops and made one of his all time favorite family desserts; chewy bars. 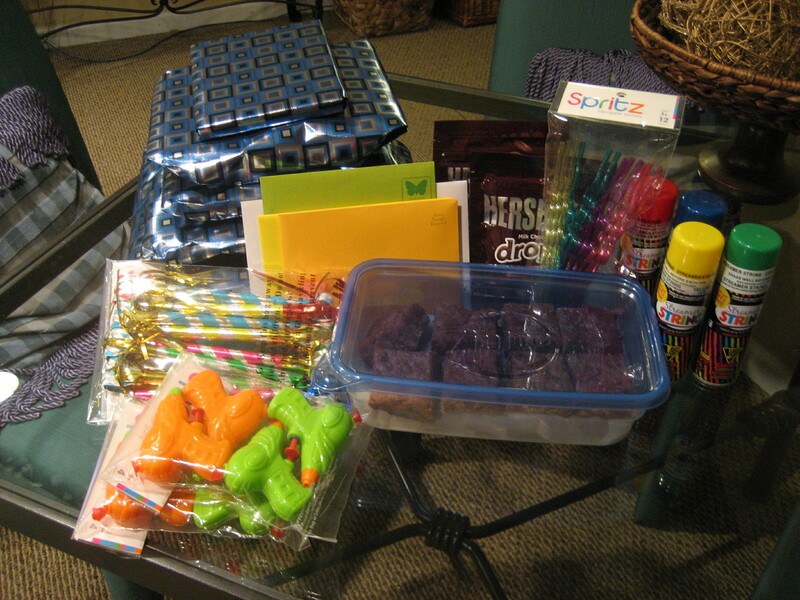 To create a feeling of festivity, I packed crazy straws, party blowers, water guns and silly string. I hope he and his new friends are racing up and down the dorm room halls having fun and acting silly. That’s exactly what a 19 year old should be doing. More birthday celebrations, more fabulous festivities, more family traditions, more missing Nick on his 19th birthday…..
An Afternoon with the Universoul Circus; the Greatest Show on Earth! When I was a little girl, I fondly remember my parents taking me to the see the spectacle that was the circus; the ringmaster dressed in his shiny red jacket with a black top hat and lapels. There were clowns with their whacky antics, tigers, elephants, acrobats, tightrope walkers and trapeze artists, like the Flying Wallenda’s. While my pal’s have enjoyed the spectacle of the Ringling Brother’s & Barnum and Bailey Circus, their generation is much more familiar with the music, artistry and daring acts of the likes of Cirque De Soleil. I was really excited to take Amanda to the Universoul Circus; the perfect blend of old and new. One of the things I loved the most was that the circus was actually under the big top; a great big tent in the middle of the park. Even though the surroundings were a throw back to yesteryear, the upbeat tempo of the show was anything but. Instead of a boring and staid ring master, the master of ceremonies was the lively and entertaining Tony Tone, who kept the show rolling through costume and set changes with his humor, singing and fabulous dance moves. We sat in awe (and mock terror) as we watched the tightrope walkers make their way; dancing, bike riding, walking two-men high and then three-men high across the rope. Our hearts were in our mouths as one of the fellas leap frogged over another two, landing perfectly on that wee, little tiny rope. Wow! And we thought the balance beam looked hard. This circus has everything, but with soul and style. To the smooth sounds of Luther Vandross, there was Jean Claude who performed stunts of amazing strength, artistry and elegance. In a giant sphere, there were 4 motorcyclists riding round and round (and upside down, rockin’ to the rhythm of the funky sound) and Chinese acrobats on bicycles hand-standing, arabesque-ing, leaping from bike to bike, all whilst the girls were cycling around and around in a fast circle. 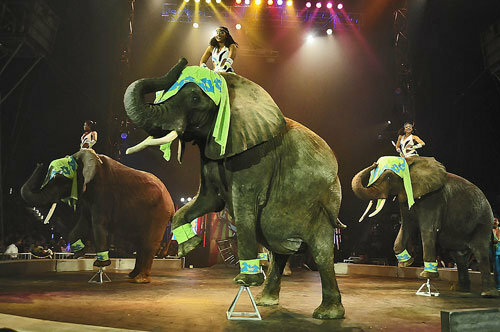 The circus just wouldn’t be complete without leaping and dancing tigers and beautiful and majestic elephants. While the entire show was great fun, my absolute very favorite part was the Zhukau Acrobats; a kind of Michael Flatly, Lord of the Dance, meets strong man tumbling sensations. Swinging from pendulums, these fellas performed heart-pounding, death defying acts; twists, flips, triple backs and triple fronts with a half twist. Fortunately, Amanda knew exactly what they were up to. More acrobats, more animals, more daring acts, more mother/daughter outings……. Dagwood, Eat Your Heart Out; The World’s Greatest Sandwich! 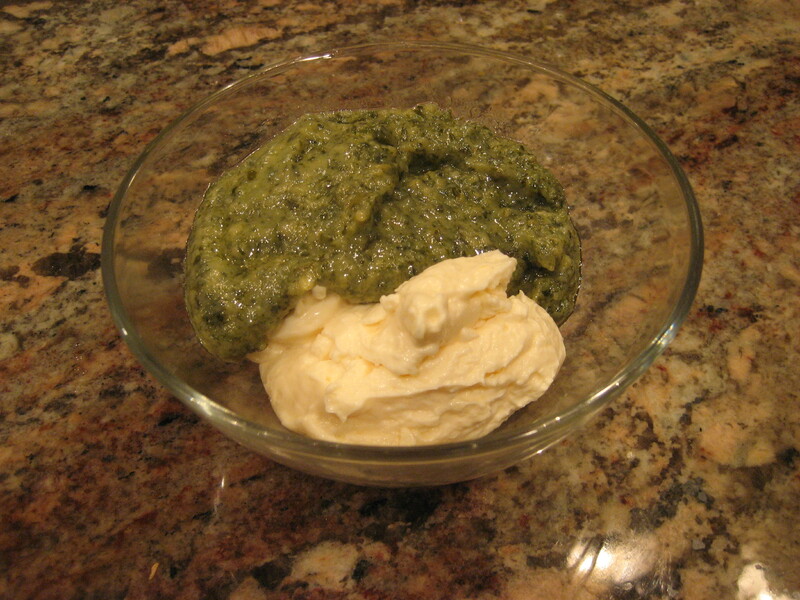 As the More is More Mom®, I’m all about……..more mixing it up at dinnertime! 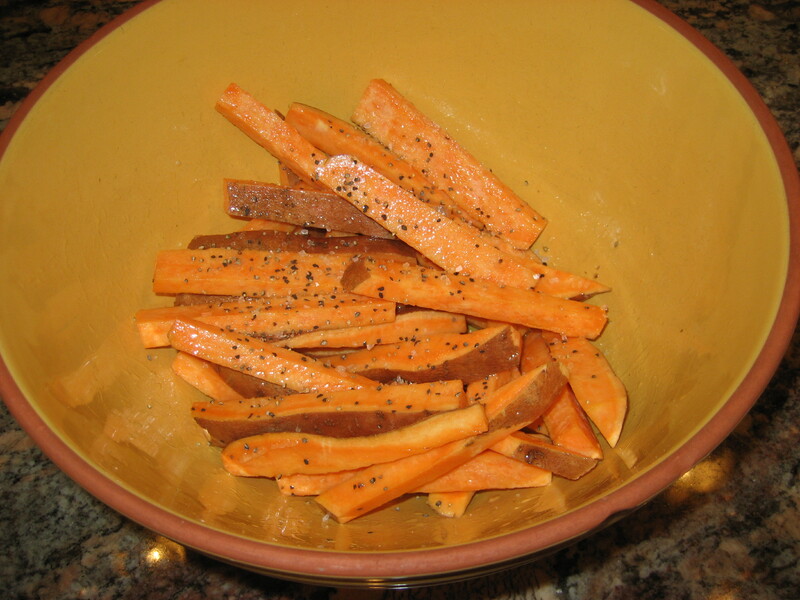 While most nights we enjoy a great dish with all the fixings, sometimes it’s a real treat to simplify. 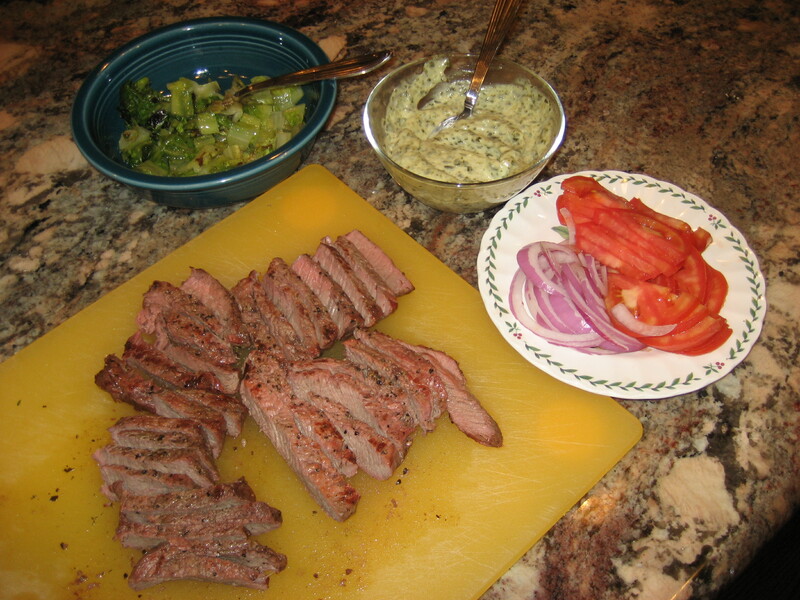 The other night, I made a sandwich that was so delicious Dagwood would have been jealous! We don’t really eat fried food, but life would not be worth living without French fries. 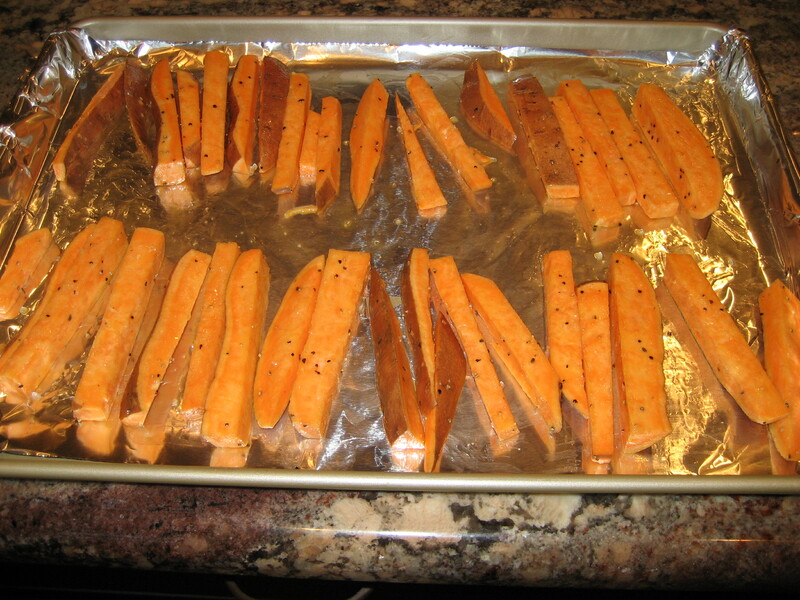 As an alternative to that big fat greasy mess, I like to bake mine; either sweet potatoes or the classic Idaho. 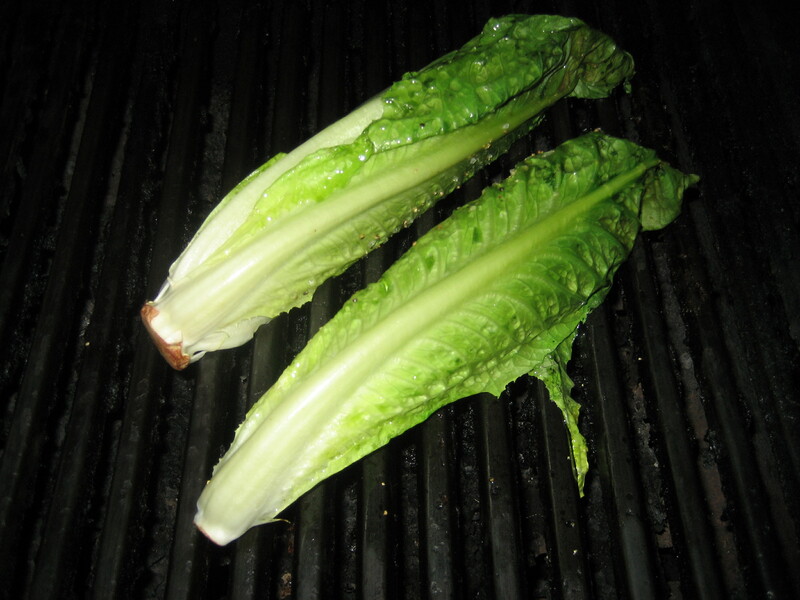 Place a sandwich, sliced in half, on a plate with a hearty helping of fries! 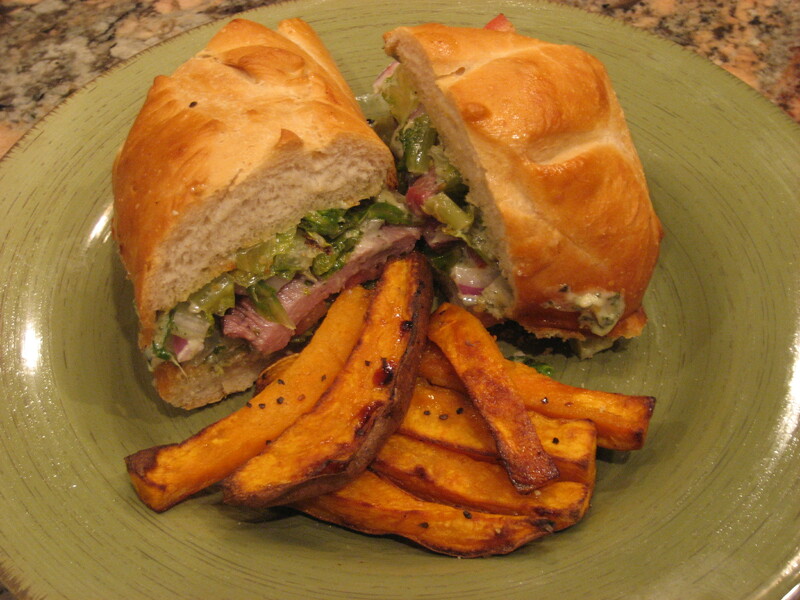 More mixing it up, more sweet, sweet potatoes, more delectable Dagwood sandwiches…. 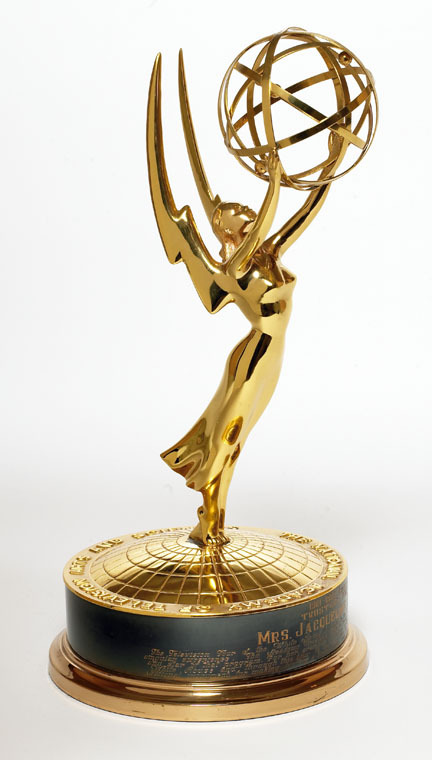 As the More is More Mom®, I’m all about…..more Emmy Award’s! I am absolutely in love with the fantasy of going to the movies, which is why my favorite show of the entire year is the Oscar’s. However, what sustains me throughout our ordinary daily lives is…..television. The Emmy’s is like a gigantic kick-off to the fall season. However, before we celebrate this past year of entertainment (and look forward to the coming weeks. Yay! ), we must acknowledge those who have been here for us, supporting us, for the past 90 days; our friends at Bravo! A great big hat’s off to Bravo for making our summer bearable. While ABC, NBC and CBS have been showing ho-hum, boring reruns, Bravo has had the decency to entertain us with new programming. Housewives after Housewives, Millionaire Matchmaker, Top Chef, reunion shows with cutie pie Andy Cohen (Mazel!) and my all time favorite human being on television; Jeff Lewis of Flipping Out. I love him because he is a total ball buster who happens to have a big heart and exquisite taste. This year, the Emmy’s were hosted by the fabulous Jane Lynch, otherwise known as both Sue Sylvester on Glee and Charlie Sheen’s therapist on 2 ½ Men. She’s amazing, and while I love, love, love, her, she just wasn’t as funny as Jimmy Fallon last year (whom I also love, love, love and isn’t as funny as Craig Ferguson. Maybe Craig Ferguson should host the Emmy’s!). We are such total Modern Family maniacs at our house that I refuse to allow anyone to erase the second season we have recorded on our DVR until someone buys me the DVD compilation for Christmas. With all the awesome new TV coming in the next 24 hours, it’s a good thing we have 2 DVR’s. Julie Bowen, Claire on Modern Family is very, very good, but I wonder how she edged out Jane Lynch? I really thought that she and Gloria (Sofia Vergara) would have cancelled each other out. Ty Burrell was fabulous this season as the fumbling Phil Dunphy. Thankfully the Emmy voters got that one right. Unfortunately, this Emmy show was a complete dud! It was about as boring as the Academy Awards with Anne Hathaway and James Franco. The first funny moment happened 45 minutes into the telecast when Rob Lowe and Sofia Vergara introduced the nominees for Lead Actress in a Comedy. Amy Poehler was a riot! When her name was announced as a nominee, she sauntered up to the stage as if she were the winner. The other nominees; Melissa McCarthy, Martha Plimpton, Eddie Falco (who was rockin a hard body like she was Madonna), Tina Fey and Laura Linney, all followed suit. They held hands on stage like they were contestants in a beauty pageant, just waiting for Miss America to be announced. Melissa McCarthy won for Mike & Molly and she was crowned with a tiara and awarded with a beautiful spray of roses. She’s from Plainfield, you know. As insane as Charlie Sheen had been when he fell off the deep end in the spring, I was kind of hoping for a little tiger blood fighting warrior, but he must have been on his meds, darn it. He wasn’t humorous in the least as he announced Jim Parsons, from the Big Bang Theory, as Lead Actor in a Comedy. Clearly I am not smart enough to get it; how did he beat both Steve Carell and the amazing Alec Baldwin? After another 30 interminably boring minutes, was the second amusing moment of the evening; the “epic” musical event starring Andy Samberg and Michael Bolton. Apparently Michael Bolton hadn’t been embarrassed enough with his dismal performance on Dancing with the Stars, because now he agreed to dress up as a singing Captain Jack Sparrow. I must admit, we did get a little chuckle when Ed Helms, John Stamos and Maya Rudolph dressed up as Justin Timberlake, Andy Samberg and Lady Gaga, singing, “It’s not gay if it’s in a three way,” (the SNL rerun episode aired last night). Margo Martindale won for Supporting Actress in a Drama in Justified (I’d never even heard of that show). Peter Dinklage was your Supporting Actor Drama for Game of Thrones (clearly too high brow for me). Julianna Margulies (who will always be Nurse Hathaway on ER ) was Best Actress in a Drama for The Good Wife. Since she is married to Mr. Big, I might consider checking that one out. Kyle Chandler was the Best Actor for Friday Night Lights. I haven’t seen the TV show, but the movie was excellent! Apparently, we don’t do dramas. While they looked amazing, the boys from Entourage were as boring as their final season, though they kicked off the awards for the best in mini series; Supporting Actress, Maggie Smith (Professor McGonagall of Harry Potter fame), Supporting Actor, Guy Pearce (? ), Lead Actor, Barry Pepper (he was awesome as Roger Maris in *61 and Saving Private Ryan), and of course, Lead Actress, the beautiful Kate Winslet. The show was so uneventful that it couldn’t end soon enough, but not before awarding Modern Family and Mad Men as tops in Comedy and Drama. With all that celebrating behind us, we have an entire season of our favorite television to look forward to. Hip, hip, hooray for the idiot box! If You Can’t Beat ‘Em, Join ‘Em…. 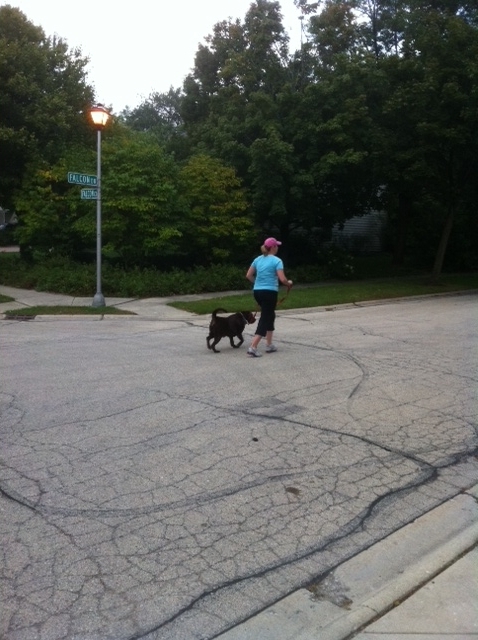 As the More is More Mom®, I’m all about…..more keeping up with my fitness focused teenagers! When I was little, girls were only involved with things like ballet, figure skating, gymnastics and tennis. I was clueless to the fact that there was a great big world of athletics just waiting to be experienced. My leanings have always tended towards shopping as a sport. I could have totally won gold at the mall. My people happen to subscribe to the life philosophy; all sports all the time. Because more of everything is always better, each summer when Nick was little, I signed him up for eight weeks worth of swimming lessons. It never did quite register with me that all the other kids only participated in a single two week session, rather than the whole enchilada. By the time Nick was going into the 2nd grade, he had completed every single solitary swimming lesson our park district had to offer. The only thing left was life guarding. He was 7. Sports conditioning has always been a way of life for my two. Hockey was the inspiration for Nick’s particular obsession with leg strength and cardio. Forever he could be found doing wall sits, squats and marking off 75 and 100 meter increments out in front of our house for me to time his sprinting drills with a stop watch. In fact, his favorite Christmas gift this year, other than his Sam Adams (Boston rapper) CD, was a mini parachute that gets strapped to your back to offer resistance while you run. Rarely has Wrigley found anything more exciting than chasing Nick down the street trying to wrestle and dominate the parachute. Of course, Amanda has been a gym rat since she stared gymnastics when she was 4. Never one to be left out, she’s always been all too eager to join Nick, no matter what the challenge. In fact, once she retired from gymnastics this winter, she and her brother became constant workout companions. With her school and AAU track seasons over and her work out partner off to college, Amanda was in need of a gym buddy. I was only too happy to volunteer for the job. Selfishly I figured, if I worked out with her, maybe some of her fitness would rub off on me. While I’ve been working out for the past 20 years (you know, the usual mom stuff; going to the health club, running, biking, weight training, chatting), I’m absolutely exhausted! Box jumps, plyometrics, circuit training, weight lifting and serious abdominals (none of this doing a couple of crunches malarkey). They say if you can’t beat ‘em, join ‘em. I say if you’re brave enough to join them, be sure to eat your Wheaties!